Day 171 - The half-way mark! You know when you get to the end of a year and you think ‘Where did that year go?’ My greatest fear before we embarked on our journey was that we would get to the end of our year and we would feel it went too fast. Well, this day makes the half way point of our round the world adventure and we are all still alive and well and it feels like it is moving at just the right pace. I still find it difficult to believe that we are actually on the other side of the world and will often pinch myself to make sure it’s still real. The last 171 days have had their share of highs and lows; fun and frustrations but overall have been everything I hoped it would be. When we set off from Australia on 4thFebruary this year we had really no idea what to expect. In fact we had no great expectations of what we would see and do but were ready to roll with it and let the year develop. Many people set out on long-term journeys with a set agenda; we simply didn’t have the time to plan extensively before we left and anything we saw and did was going to be new and different. We knew that we were never going to see and do everything in the world in 12 months so everything we could fit in was a bonus. We had a small bucket list of places to go, like the Great Wall of China and more importantly, people to see; like my old friends in Sweden, Denmark, Luxembourg, Belgium and UK. As we were flexible in our plans we were also able to discover surprise destinations along the way like Taiwan and to be able to visit new friends in Hong Kong, Sweden, UK and catch up with friends in England, Vietnam and France. We knew we were going to divide our year into three distinct parts; four months in Asia, four months in Europe and 90 days in North America. We had flights booked in and out of each continent and accommodation booked in the first 3 cities. After that … the rest was a true mystery. I am still amazed at just how easy it is to travel the world with two children. We set off as very inexperienced travellers and first time backpackers and have had no major problems negotiating the world; even in Asia. We knew if we could make it through four months of travel in Asia that Europe and North America would be comparatively easy. Asia was a constant barrage to the senses, very exciting and so different to our every day existence back in small town Australia. We eased into Asia by staying with my cousin and his family in Jakarta, Indonesia where we could experience Asia with translators, a driver and a maid! Even our next stop in Malaysia was easy because we had the support of our guesthouse hosts who were exceptional in their service and assistance. Cambodia was where we really branched out with independent travel in booking buses, hotels, tours and trying out luck with the local cuisine; sometimes to our own detriment as Steve can attest. We spent one wonderful month in Cambodia and became accustomed to the grotty toilets, barrage of people selling ‘stuff’ and cheap beer; however the poverty that is everywhere is impossible to accept. Cambodia is still a country requiring so much international assistance; but you can see it progressing before your eyes. We had the amazing opportunity to volunteer at a school for nearly 2 weeks. In this time we got to know the students and teachers and gain an appreciation for how hard they were working at bettering their lives. There are some wonderful young students at the school that we hope through attending the Tanop Community Education Centre will go on to have very bright futures and better the lives of their fellow Cambodians. Thank you TCEC for such a treasured experience. After Cambodia we made it over the border in the south of Vietnam with a four week visa. Once again we arrived without a concrete plan. In Asia this isn’t an issue because with so many millions of people to cater for, tours, buses, planes, trains etc are running all the time and you don’t have to think too far ahead. Our four weeks in Vietnam turned into 6 weeks when we got a visa extension. This meant that we could stay in Vietnam to see the major sights of Sapa, Halong Bay and Tam Coc in the north. All of these were fantastic places to visit but we were certainly becoming weary of our time in Vietnam by now and were keen to escape to the relative sanity of Hong Kong. We spent one quieter week in Hong Kong in a tiny 2 bedroom apartment; small but luxury compared to a hotel room as we even had a small kitchen and washer/drier. We felt no pressure to take in the sights of Hong Kong since Steve and I had been there once before and the kids had seen their share of markets and temples already. We did fit in the best of Hong Kong e.g. The Big Buddha, the Peak Tram, Star Ferry and the laser light show at night along the harbour. 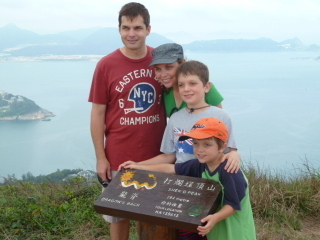 The highlight for us was meeting up with Karin and Ed, a couple we had met in Halong Bay. They took us hiking along Dragon’s Back; drinks at Stanley and a BBQ on their balcony overlooking the water. Thanks again – we hold that time with you very dear to our hearts because it was so generous of you both. Taiwan was our next stop. Initially this was a place I had never considered visiting before but after seeing advertisements for Taiwan in Malaysia, it got me thinking. We took a one week detour to Taipei and Taroko Gorge on the east coast. Had we known just how fantastic Taiwan would be; easy to get around, affordable, friendly and a great mix of city and nature; we would have spent more time here and skipped Hong Kong! We were sad to leave for mainland China but I had a wall and some warriors to see. 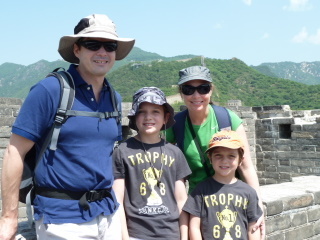 We did a three city tour of China given that we had just two weeks left in Asia. We flew into Shanghai for a few days; off to Xian to see some really cool warriors and ended in Beijing for eight nights. Our last week in Beijing in our hostel was very relaxing and full of hidden surprises like our meeting with Simone! (Hi!) Simone showed us around the local area; found us good food and helped me with a haircut; all shared experiences that made our time there more memorable and special. We celebrated Children’s Day with the boys in China and saw ‘Kung Fu Panda 2’ in Beijing; really cool to see in China! That was the end of our Asian journey; hello Europe. We arrived into London and the next chapter of the year began. We took a while to find a new groove after cruising through Asia for so long. It wasn’t as easy to just ‘cruise’ through the UK and not as cheap either. Once we got ourselves sorted out and a rough outline of our movements we hit the UK roads for a week to try out our camping equipment. We then crossed the Channel and drove to Sweden to see my old friend Kinney. We spent 3 memorable weeks in Sweden catching up with Kinney and some new friends we had made through our travels in Vietnam. We were overwhelmed by everyone’s hospitality and look forward to being able to extend the invitation to our friends when they visit us in Australia. We hadn’t ever set out to spend three weeks in Sweden but we are so glad we did. 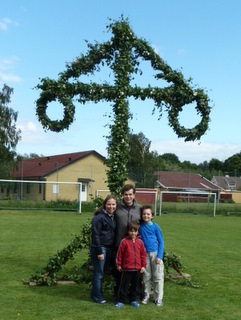 It was only during our time in Sweden that we worked out what we would do for the remainder of our time in Europe. Leading up to the half way point, we headed back through Denmark to visit my old friend Gitte, which was a lovely night in a beautiful location. We drove through Germany for one week before heading to Luxembourg to visit another old friend Judit; and it is here that we celebrated our half way anniversary with a selection of cheese, meat, baguette and beer! Perfect. The remainder of our year is starting to come together as we think about what we want to see and do in the next 171 days. Would I have changed anything we have done so far? Hmm, apart from maybe spending more time in the Kampot/Kep area of Cambodia; slightly less time in Vietnam and more time in Taiwan; we have really enjoyed our travels so far. The highlight of our time so far is meeting so many wonderful people and getting to know countries better through our new and old friends. Are we sick of living out of a suitcase? To be honest, no. We have now extended our backpacks to what we can hold in the car with our acquired camping equipment, but still for a family of four we are carrying relatively few things. I shudder when I think about all the ‘stuff’ we have at home in storage and what we will do with it all when we return home. That is still 171 days away and we have so many wonderful adventures still ahead of us as we complete our time in Europe and then go to the USA. We plan on another week of European driving before we head to the UK for one month of driving and camping. In September we spend a month in Spain for me to attend Spanish school and Steve to attend sailing school out of Gibraltor. We then head to the USA/Canada and are thinking of going west in a motorhome and south to Florida. The highlight of our time in USA will no doubt be catching up with friends. I’m looking forward to my family experiencing Halloween, Thanksgiving and Christmas; and some snow would be good too! Money … everyone no doubt wants to know how much it has cost us so far. I don’t actually know unless I go back through our credit card statements and bank accounts. To give you an idea of how we are managing this; Steve’s mate has borrowed his truck and is paying for those bills this year; we received long service leave payments from our jobs which gave us an income for 3 whole months plus we have replaced one set of bills with another. We don’t pay electricity, water rates, land taxes, internet, phone, groceries, petrol, school fees and extracurricular costs but we do pay for campsites, hotel accommodation, groceries/dining out, bus tickets etc, UK mobile phone, new camping equipment and sightseeing. Some people travel and record every dollar; we haven’t. We are frugal in where we sleep, what we eat and what we do but not so tight that we can’t enjoy the local food, beer and the occasional castle. We have also been very lucky that we have wonderful friends that have welcomed us into their homes and spoilt us when we have stayed with them with food, drink, outings and the use of their washing machines! Thank you! Keep following our four dots as the move around the map. Thanks for all your wonderful comments. We love reading your comments and know that you are sharing our journey with us. We can’t wait to see what the next 171 days will bring. I’ll keep you posted! Karina – I’m so glad you are having a wonderful time away. I can’t wait to have you home, but don’t worry you’re not missing much excitement here. A year really does go quickly. One day I hope to be off travelling with my little clan – further than Bundaberg and Jimboomba again! Yippee I keep telling Erin I’ll take her on a big holiday oneday!